Injection of platelet rich plasma (PRP) has been recently gaining the interest of physicians. Many common ailments that traditionally have not had many treatment options have responded to PRP injections. 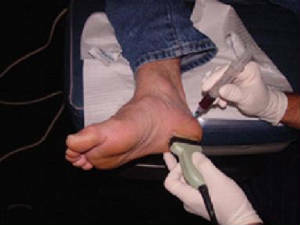 Certain conditions such as plantar fasciitis, achilles tendinosis and even tennis elbow (lateral epicondylitis) have been successfully treated with injections of PRP. In the past steroid injections have been the most common approach to treat these tendonopathies. Although some short term relief is possible from steroid injections, long term benefits are questionable. With steroid injection we hope to decrease inflammation and reduce pain. With PRP injections, we are actually repairing the injury or damage. For a list of physicians that provide PRP injections services, please contact us or see the Patient Resources tab for a direct links to their office.